Synonyms and Other Names: Grassy rush; Water gladiolus; Butomus junceus Turcz. Identification: Butomus umbellatus is a moderately tall, rush-like perennial. Its leaves are basal originating from a stout rhizome that is stiff and erect when immersed or lax and floating when in deep water. The inflorescence is a many-flowered umbel borne. The flowers are perfect, regular, 2-3 cm across, and pink. There are 3 sepals, which are petaloid. There are 3 petals and 9 stamens with elongate anthers. It has 6 pistils that are simple, whorled, and united at the base. Its fruit is an indehiscent, many-seeded capsule (GISD, 2005). Table 1. States with nonindigenous occurrences, the earliest and latest observations in each state, and the tally and names of HUCs with observations†. Names and dates are hyperlinked to their relevant specimen records. The list of references for all nonindigenous occurrences of Butomus umbellatus are found here. Ecology: Butomus umbellatus grows in lakes, riparian zones, water courses, wetlands, and marshes. It can tolerate water as deep or deeper 2 meters, where cattail is normally found, and can extend to the deepest range of native emergent marsh species (except possibly for hard-stem bulrush and wild rice). Once established in a marsh, populations tend to increase and persist indefinitely. Water level fluctuations may promote the spread of B. umbellatus, allowing populations to expand when water levels are low and the soil surface is exposed and warmed (Hroudová et al. 1996). However, severe or long-lasting decreases in water level could result in the reduction of B. umbellatus populations (e.g., Hudon 2004). It is intolerant of salt or brackish water. Butomus umbellatus is a perennial plant. It is in flower from July to September, and the seeds ripen from August to September (in North America). The scented flowers are hermaphroditic and are pollinated by bees, flies, and lepidopterans. Although Canadian populations of B. umbellatus appeared to be incapable of autonomous seed production (without external pollination assistance), plants were self compatible and produced more seed when self-pollinated (Eckert et al. 2000). Flowering rush can be fertile (both spread by sexual reproduction and seeds or by vegetative means) or sterile (can only reproduce by vegetative means (Lui et al. 2005, Parkinson et al. 2010). Diploid populations of B. umbellatus can reproduce sexually via seed production and clonally via the branching and fragmentation of rhizomes and the production of small bulbils on both the rhizomes and inflorescences (Lui et al. 2005). Most B. umbellatus populations in the Great Lakes are diploid and capable of producing abundant viable seed, although the major method of reproduction appears to be clonal (Lui et al. 2005). Sterile triploid populations of B. umbellatus also exist in the Great Lakes region. North American triploid populations rarely flower and also have a limited ability to multiply and disperse via clonal reproduction, although they may have a greater ecological tolerance than diploid populations as a result of polyploidy or of greater investment in vegetative growth (Lui et al. 2005). Triploid populations also appear to be spread more commonly through the horticulture trade. Lui et al. (2005) suggested that these different reproductive strategies are indications of two different forms of B. umbellatus in North America with different life histories and invasion histories. Diploid and triploid populations of B. umbellatus exist throughout its global range, although reproductive traits and strategies may differ by region (e.g., North American vs. European populations) (Hroudová and Zákravský 1993, Lui et al. 2005). Relative to native European populations, Brown and Eckert (2005) found that nonindigenous North American diploid populations invested much more biomass in reproduction and were more likely to produce both inflorescences and clonal bulbils. Post-establishment survival was also over twice as high for North American populations as it was for European populations (Brown and Eckert 2005). 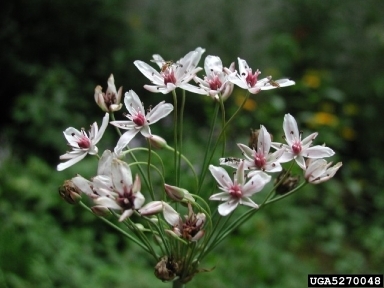 Flowering rush has a very wide range of hardiness (zones 3-10) which makes it capable of being widely invasive in the United States (IPANE 2001). Means of Introduction: Butomus umbellatus was intentionally brought to North America from Europe as a garden plant for ornamental purposes. Ship ballast has also been cited as a potential vector for the initial introduction. It can be spread over long distances by garden planting, and once established in a watershed, it spreads locally by rhizomes and by fragmentation of the root system. Muskrats reportedly use parts of the plant and contribute to its local spread, though the importance of this particular vector in spreading has not been investigated (Staniforth and Frego 1980). Populations may be spread via the horticulture trade (Lui et al. 2005), and boaters can also transport flowering rush on their equipment. Water and ice movements can easily carry it to new areas of a water body (Proulx 2000). Status: Butomus umbellatus is a prohibited species in Illinois, Michigan, and Minnesota, and is restricted in Wisconsin (GLPANS 2008). A recent survey of Minnesota Nursery and Landscape Association Members revealed that 80% of respondents were incorrect or unsure of the non-native character of B. umbellatus despite its prohibited status in Minnesota (Peters et al. 2006). Impact of Introduction: Butomus umbellatus can displace native riparian vegetation, and can be an obstacle to boat traffic. Its very wide range of hardiness (zones 3-10) makes it capable of being widely invasive in the United States (IPANE 2001). Control of this species is very difficult, especially with herbicides because they easily wash away from the narrow leaves of this plant. Extensive physical methods of control must be employed to manage this invasive exotic. It can be spread over long distances by garden planting, and once established in a watershed it spreads locally by rhizomes and by fragmentation of the root system. Muskrats use parts of the plant and contribute to its local spread. Boaters can also transport flowering rush on their equipment. Remarks: The name Butomus umbellatus forma vallisneriifolius (Sagorski) Glück has been used for plants that grow totally submersed or have floating leaves. Field transplant experiments with North American plants (R. L. Stuckey et al. 1990) have demonstrated that the non-flowering submersed form can be converted to a flowering mudflat form, and that flowering terrestrial plants can be transformed into non-flowering submersed ones. Consequently, B. umbellatus f. vallisneriifolius is a deep-water growth form and should have no taxonomic systematic status. A map of Butomus in North America, prepared by R. L. Stuckey (1994), showed that he accepted two species. His map essentially had everything east of Niagara Falls as B. junceus and everything west of the Falls as B. umbellatus. At this time, experts do not accept two species in the genus. Brown, J.S. and C.G. Eckert. 2005. Evolutionary increase in sexual and clonal reproductive capacity during biological invasion in an aquatic plant Butomus umbellatus (Butomaceae). American Journal of Botany 92(3):495—502. Delisle, F., C. Lavoie, M. Jean, & D. Lachance. 2003. Reconstructing the spread of invasive plants: taking into account biases associated with herbarium specimens. Journal of Biogeography 30:1033—1042. Eckert, C.G., B. Massonnet, J.J. Thomas. 2000. Variation in sexual and clonal reproduction among introduced populations of flowering rush, Butomus umbellatus (Butomaceae). Canadian Journal of Botany 78(4):437 —446. Flora of North America. 2008. www.eFloras.org. Global Invasive Species Database. 2005. Available http://www.issg.org/database/species/ecology.asp?si=610&fr=1&sts=sss&lang=EN. Accessed 19 September 2011. Higman, P., and S. Campbell. 2009. Meeting the Challenges of Invasive Plants: A Framework for Action. Michigan Department of Natural Resources Wildlife Division. Lansing, Michigan. 87 pp. Hroudová, Z. and P. Zákravský. 1993. Ecology of two cytotypes of Butomus umbellatus II. Reproduction, growth and biomass production. Folia Geobotanica and Phytotaxonomica 28(4):413—424. Hroudová, Z., A. Krahulcová, P. Zákravský, V. Jarolímová. 1996. The biology of Butomus umbellatus in shallow waters with fluctuating water level. Hydrobiologia 340:27—30. Hudon, C. 2004. Shift in wetland plant composition and biomass following low-level episodes in the St. Lawrence River: looking into the future. Canadian Journal of Fisheries and Aquatic Sciences 61(4):603—617. Invasive Plant Atlas of New England (IPANE). 2009. University of Connecticut. Available http://www.eddmaps.org/ipane/. Accessed 5 April 2012. Jensen, D. 2011. Flowering rush (Butomus umbellatus). Minnesota Sea Grant. Available http://www.seagrant.umn.edu/ais/floweringrush. Accessed 20 March 2012. Lavoie, C., M. Jean, F. Delisle, and G. Létourneau. 2003. Exotic plant species of the St Lawrence River wetlands: a spatial and historical analysis Journal of Biogeography 30: 537—549. Les, D.H., and L.J. Mehrhoff. 1999. Introduction of Nonindigenous Aquatic Vascular Plants in Southern New England: A Historical Perspective. Biological Invasions 1(2): 281-300. Lui, K. 2001. Genetic causes & consequences of variation in sexual fertility amoung introduced population of clonal aquatic plant Butomus umbellatus (Butomaceae). Master of Science Thesis. Queen's University Kinsgton, Ontario, Canada. 126 pp. Lui, K., F.L. Thompson, and C.G. Eckert. 2005. Causes and consequences of extreme variation in reproductive strategy and vegetative growth among invasive populations of a clonal aquatic plant, Butomus umbellatus L. (Butomaceae). Biological Invasions 7:427—444. Manitoba Purple Loosestrife Project (MPLP). 2006. Flowering rush, an invasive plant found in Manitoba: Butomus umbellatus. Invasive Species Council of Manitoba. Available http://www.invasivespeciesmanitoba.com/site/uploads/pdf/fs_flowrush.pdf. Accessed 2011. Marsden, J.E., and M. Hauser. 2009. Exotic species in Lake Champlain. Journal of Great Lakes Research 35: 250—265. Minnesota Department of Natural Resources (MNDNR). 2012. Flowering rush (Butomus umbellatus). Available http://www.dnr.state.mn.us/invasives/terrestrialplants/herbaceous/floweringrush.html. Accessed 20 March 2012. New York State Department of Environmental Conservation (NYDEC). 2011. Interim Invasive Species Plant List. Available http://www.dec.ny.gov/animals/65408.html. Accessed 20 March 2012. Ohio Division of Natural Areas and Preserves. 2000. Ohio's Invasive Plant Species. The Nature Conservancy, Columbus, Ohio. 2 pp. Özbay, H. and A. Alim. 2009. Antimicrobial activity of some water plants from the northeastern Anatolian region of Turkey. Molecules 14:321—328. Parkinson, H., J. Mangold, V. Dupuis, and P. Rice. 2010. Biology, Ecology and Management of flowering rush (Butomus umbellatus). The U.S. Department of Agriculture, Montana State University Extension. Bozeman, MT. 12 pp. Peters, W.L., M. Hockenberry Meyer, and N.O. Anderson. 2006. Minnesota horticultural industry survey on invasive plants. Euphytica 148:75—86. Proulx, N. 2000. Exotic Flowering Rush. Minnesota Sea Grant: Regents of the University of Minnesota. Available http://www.seagrant.umn.edu/ais/floweringrush. Accessed 5 March 2012. Rice, P. and V. Dupuis. 2009. Flowering rush: an invasive aquatic macrophyte infesting the headwaters of the Columbia River system. Center for Invasive Plant Management (CIPM), Montana State University, Bozeman, MT. 11 pp. Seizer, M. 2009. The Michigan Department of Environmental Quality Biennial Remedial Action Plan Update for the River Rasion Area of Concern. Water Bureau, Aquatic Nuisance Control & Remedial Action Unit: Michigan DEQ, Lansing, MI. 15 pp. Staniforth, R.J. and K.A. Frego. 1980. Flowering rush (Butomus umbellatus) in the Canadian prairies. Canadian Field-Naturalist 94(3):333—336. Trebitz, A.S. and D.L. Taylor. 2007. Exotic and invasive aquatic plants in Great Lakes coastal wetlands: distribution and relation to watershed land use and plant richness and cover. Journal of Great Lakes Research 33:705—721. United States Department of Agriculture National Resources Conservation Service (USDA, NRCS). 2008. The PLANTS Database. National Plant Data Center, Baton Rouge, LA. Available http:// http://plants.usda.gov. Accessed 5 August 2008. White, D., E. Haber, and C. Keddy. 1993. Invasive plants of natural habitats in Canada: an integrated review of wetland and upland species and legislation governing their control. Canadian Wildlife Service, Environment Canada, Ottawa, Ontario.